Time to follow through on the feedback from this post. One thing which is also clear, non-IT people, meaning your users or employees do not care to understand that their mail file is a database in Lotus while Outlook treats it really as a file directory. A huge difference on so many levels. I will not go into great technical depth here, so for those that want it, all I will say is you will NEVER win an argument about technological benefits. In no specific order I will go through some of the answers. It seems Outlook is viewed as faster to use. While this may appear to be true, if you disabled all the files it require that are loaded at startup, your Windows would boot faster and not be so sluggish. You see the lawsuits in Europe were not in vain, they were trying to get Microsoft to stop embedding all their products in the client. Outlook, Explorer and more are enabled via the 100's of DLLs running on your pc. So shut all of them down and then try to open Outlook. Not so simple or fast anymore is it. This is what Lotus Notes and any other non Microsoft product has to work with. In contrast, on Linux Lotus Notes is very fast to open and work while Outlook is really...non existent. But appearance, especially to some people, is everything. Deleting a folder deletes the email in it also. Naturally in a file directory structure this makes sense. In a database, where a folder is just a view, it does not. Could it be done? Sure, a basic agent could pop up and ask if you want the emails inside to be deleted as well but it doesn't. Is this truly a reason to prefer Outlook? Of course not. Is it inconvenient? That depends on your administrator and your view of archiving and if you truly need the data or emails. Integration with Active Directory is an interesting idea. It does not make Outlook better or worse. AD is just a Directory. Sure it runs a bunch of other things and requires an army of servers to be built properly, but is it better to integrate to AD? In short, it depends. Domino can LDAP to AD just like anything else, but if you are asking for the integration of user ID files into AD, that is one thing. If one uses Tivoli Directory Integrator you can achieve better synchronized integration that without it. A manual process can be very time consuming, so get TDI, oh and it's free, really it is F R E E!. All the applications, online and on our PCs, integrate with Outlook. This is another misnomer. 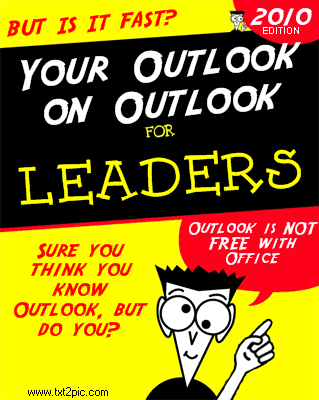 Outlook is...just..email. What program does not integrate with email? What they probably are referring to is when a program has been written to utilize Outlook's "tools". Careful though, no code works between 2000, 2002, 2003, 2007 or 2010 entirely because of full changes in coding each version, compared to Lotus Notes. Usually though the difference is the integration to the Outlook address book. Under the more open standards like iCAL, which everyone should support, the need for apps to be written to Outlook first, or even at all should go away, but it is a long process and to be honest, some Exchange admins may not realize they can use something unless it says it works with Outlook on it(If I had a dime for every one of them I need to explain SMTP and email routing). Contrast that with Lotus admins that will try to make things integrate into Notes whenever possible or ask their developers to make it work. Naturally some posted items that may at one time been unique to Outlook but no longer are or easier in Outlook according to their views. Maybe I will hit those in the next post. Although one comment said the average reading level is a 7th grade level for Americans, I refuse to believe that those in corporate America are that bad, but knowing the European side, I can see why Lotus does better there, so maybe there is something to this. I hope not, I'd like to think people are intelligent. Always a mature way to get them to consider switching, calling them idiots, hhmm not sure how well that works Keith? So I prefer Notes over Outlook, but as I said I use both. Sorry to tell you, but Outlook is way snappier even if you do what you say. Notes now has some better integration with outside calendars, it now has ICS support etc. How long did it take to get after Organizer and Outlook supported it? Too bloody long. I don't know, maybe you haven't used Outlook for a few years? It is always a good idea to be really familiar with a product you're dinging otherwise any information you provide can come across as not credible. AS for the argument Outlook is just email, well sadly that argument hasn't really helped as in quite a few cases, customers just want email, and Outlook (not Exchange) turns out to be a very good email client. If you're still in a discussion of comparing Notes to Outlook email, you're on a losing track, the value in Notes is not in email, it's in Apps. Time to switch it up. Carl, That reference was from someone's comments. I said I can understand the person's sentiment. Sure mail is an old story, but it is still one which many work with or fight with daily. Apps, are a whole other ball game and maybe that part should be deeper but then others out there discuss that more. I am not apologizing for IBM lead times to get things done, we both were inside and know what that is about. I am not a daily user of Outlook which is true, but do support people on 2003, 2007 and 2010 and need to work with whatever clients and servers they use. I use Lotus Notes (for work) and Outlook 2010 (for my personal accounts - gmail/yahoo/hotmail) and I have to admit that Outlook does some things better than Notes, like connecting to external email accounts and keeping them separate. I bleed Lotus/IBM/Yellow and I feel the pain when I see better features in Outlook than in Notes, however, as Carl said, the real benefit in Notes is: Applications, Platform Support, Integration, etc... but that's when you combine the Domino Server and Lotus Notes. Domino is way better than Exchange - last week for example, one of my customers (who migrated from Domino 6 and 7 to Exchange 2007) had a couple of hundred users without access to their outlook mail for quite a few days just because 1 user got a wrong-formatted email which corrupted the entire Mailbox (SQL Database) where hundreds of users were hosted - things like that make Domino a better platform but doesn't make Lotus Notes a better application than Outlook. Based on the demos I have seen for what's coming in Lotus Notes "Next" I'd say we have pretty good chance on convincing people that Lotus Notes is better as client. Let's hope IBM delivers the right message and attacks what it lacks. Most of this argument would be moot if IBM would implement features that (end) users have been asking for. Mentioning that features can be added via agent doesn't help if the technical ability is not present, plus you stand the risk of being denied IBM support if things go wrong. IBM are only listening to their BIG customers, they (the customers) don't need multiple email address management, so the feature is not included. I concede that IBM has to take care of it's bread and butter accounts, but consider this: if we take it that there are 142 million notes licenses out there, then if only 1% are looking for that feature that leaves about 1.5 million users who are being told tough luck, maybe next release. Convert the numbers using IBM sizing for small companies and that ranges between 1500 to 2000 "small" companies. Even if the development investment doesn't give the requisite financial ROI, the plain goodwill generated would be enough. I'm sure many admins would breath a sigh of relief not having to tell another user that "Notes" doesn't have "that" feature.